He also had a long-runing role in the popular ITV drama series ‘The Durrells’. You can see clips and read more about this here. You can meet Rudi at the Berkshire Show near Newbury on 16th and 17th September. I have an excellent head shot of Bea taken years ago.. Expect you have lots but do let me know if you would like it. Where can we see Daphne and the beautiful otters this year (2015)? Ar you at the Royal Welsh show this year. We also have some beautiful photos of the otters and some of Daphne as well. I’m sure she’d love to see the photos. Not sure about The Welsh Show this year but we hope so. Belinda is getting rather elderly but people are coming to visit the otters in the Cotswolds more and more. Where do you live? When might you next be open to visitors? My boy aged 4 is mad about them. Every time we try and sit and wait and watch for some, the waiting just proves too much with his combination of excitement and fidgety genes. Dear Clare – Thank you for your enquiry about coming to see the otters. otherwise she will be at the Newbury Show with Rudi the otter this weekend. 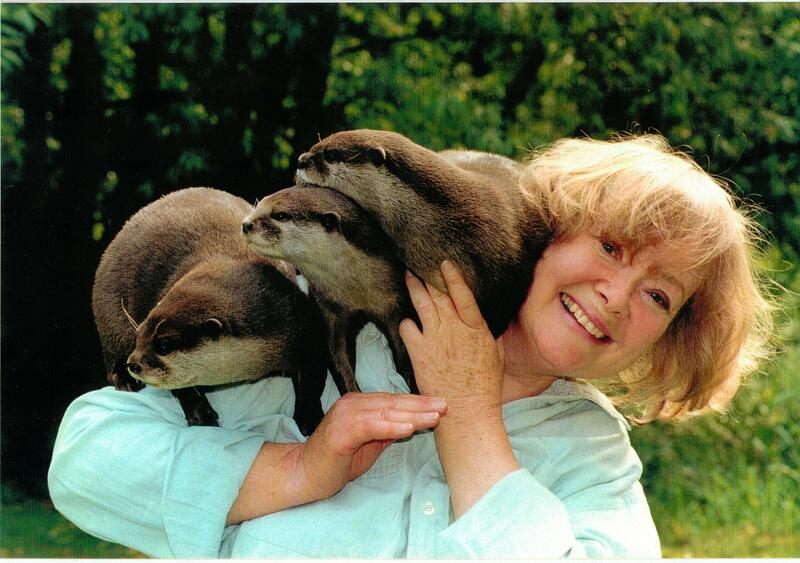 Yes, that is Daphne Neville with her otter Rudi! She’d love a copy. When I was a little boy at primary school I appeared on our local news programme with Bee. I carried her into class on my shoulder and introduced her to all my classmates. We sat and played with her and broke eggs for her to eat. Some things just stick with you and I’ll always remember it and how much my school jumper smelled of fish after!!!! Ah, you must write and tell my Mum. She is still doing the same thing. We have just been filming with Rudi the Otter for ‘The Durells’. Would you say that the talk on otters had an influence on your life? He now has a young 3 year old son of his own, & has asked me to dig out the pictures, as he wishes his young one to love them as much as he always has. Sadly they now live abroad, but he does pop over here now and then. Any chance he could see you & your present otter somewhere one day? (Preferably next year,at the earliest, as hopefully his family will grow later this year) We live in Essex, but could travel a little way! We hoped to camp on your premises one day, many years ago now, but it never became possible, unfortunately. She still has one otter and could let you know when to visit. I tried. No answer. Will try again later. I tried 3 times, Then my husband says she rang me in my absence! He had a brief chat I gather Will try again tomorrow. Success. Had a lovely chat to her, & hope to see her with my son & grandson one day. Are you on Facebook? Just watched a very pleasant You-Tube about Pip the Otter. rescued by Pia. Think Daphne would enjoy seeing it if you can find it. Pip is best friends with a Bengal cat, Sam. Lovely happy pictures of them playing together. 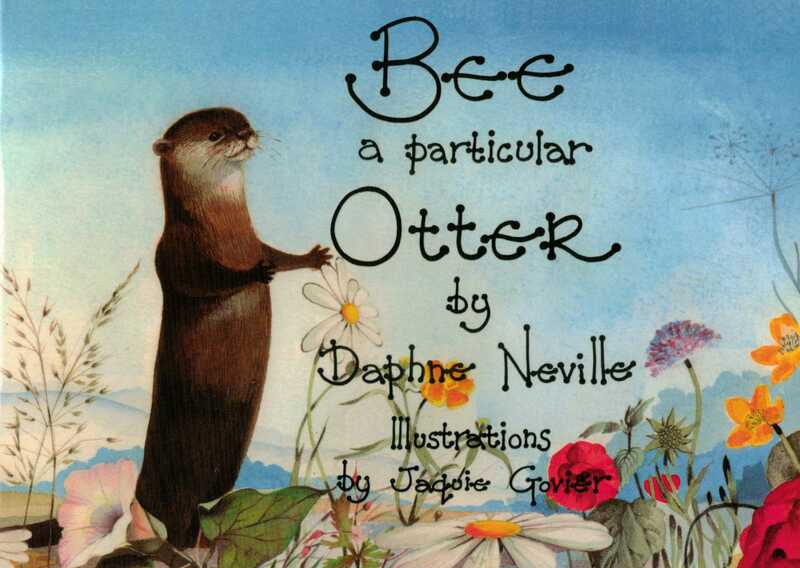 I have spent hours today trying to find a video clip of one of the otters (I think it was Bee) singing Happy Birthday….. I remember seeing it sometime in the 1990s, I think? I was so entranced by the otter and by the lovely lady! I did manage to find the clip online a few years ago, but try as I might, I can’t find it anywhere now and I wanted to show it to my son, who has recently developed a love of otters. too. Any help would be appreciated very much. Ooo I don’t think we have that clip. You could try looking on YouTube. Let us know if you find it. Rudi the otter appeared in ‘The Durrells’ on ITV and in BBC Two’s Natural World Series ‘Supercharged Otters’ recently. I’ll look for the links for you. They should be available! Thanks so much for your reply. I tried everywhere online, but I’m afraid that the clip must be lost now 😦 . Thank you for the link to Rudi, though! Rudi is quite a character. He’ll be appearing a the Malplas Show in Devon later in the year and you can always pay him a visit in the Cotswolds. Thanks very much for your reply. We live in Scotland, but I hope to make it down to the Cotswolds at some point in the next year. It’s a beautiful part of the country! This post should have links to the documentary that Rudi the Otter was in. It’s amazing. Good to hear from you Emily! You must come to visit Rudi soon. Did you see him in ‘The Durrells’, the ITV drama series? I live I cashes green stroud and an otter has just wondered by the house we are around a mile from the river and it did not look that good. Very tired and worn out it stopped when we got close so it might be a captive animal. I thought you may know someone local to me that may have lost one. I don’t think it was a wild one as it walked only a few paces in front of me.and did not run.we have put a selection of foods out(not sure if that was correct but I still did so). I think it is still around. Thank you so much for letting us know. Did it look like photos of Rudi – and the other short-clawed Asian otters on this website? Can you tell me how long it was toe to tip of tail? and whether it had claws and a long mussle? Native British otters are quite big, have long snots and claws. I don’t think you are wrong to feed it if it was looking poorly. They will take trout, raw minced beef, road-kill pheseant. My son loves otters, would it be possible to come and visit them in their natural environment? Thank u for the lovely otter photos with your mother. Sophie and thank you for a lovely chat on the telephone to your mother. you and your mother are my special friends for life. So glad you have been able to speak to Daphne. I hope you will be able to see her at Henley this summer. I am rowing in Amsterdam that weekend but I am sure you will have a good time. Do you have a DVD of Operation Murder? Dear Sophie, good luck in Amsterdam no i have not got the DVD called Operation Murder, do you mean Diagnosis Murder if you do yes i have this on DVD.let me know when and what time for me to meet your mother and it will be in Henley Regatta grounds etc. Off course! ‘Diagnosis Murder’! I’ll have to get a copy. Dear Sophie get mum to sign it without my name and then post the dvd on many thanks. Please could you remind us of your address? Thanks – afraid I can’t find the DVD on Amazon but will keep looking. Dear Sophie try EBAY UK they may have it or amazon.com USA site and other EBAY sites. sometimes it could be under another title. Thanks – I’ll take a look! Dear Sophie the DVD in question is on amazon.com the USA website i have seen it advertized. My 10 year old daughter is presenting a talk about otters at Christ church primary school Chalford this coming Thursday. I appreciate that this is very late notice, but I wondered if she could pop down to meet you after school tomorrow? Hello there, we found a young otter today confused in the road on cainscross roundabout… We looked by the canal but its deep and gushy there.. We are going to check out yhe pond there tomorrow. But we took him to another part of the river frome by thrupp/brimscome..he imediately went and found a dead rat to chew on.. So we left him and went off for tea.. Then an hour later as we were leaving there waa a group of people ll over the road who then had himbin a shoe box..i asked if it was an otter..i said..he is mine. So now i uave him again in my care. Im just wondering if i can meet your nother Daphne or chat with her about going forward with this renarkable little character..we are a home educating family and would really like to know more about them. X many thanks Ellie.